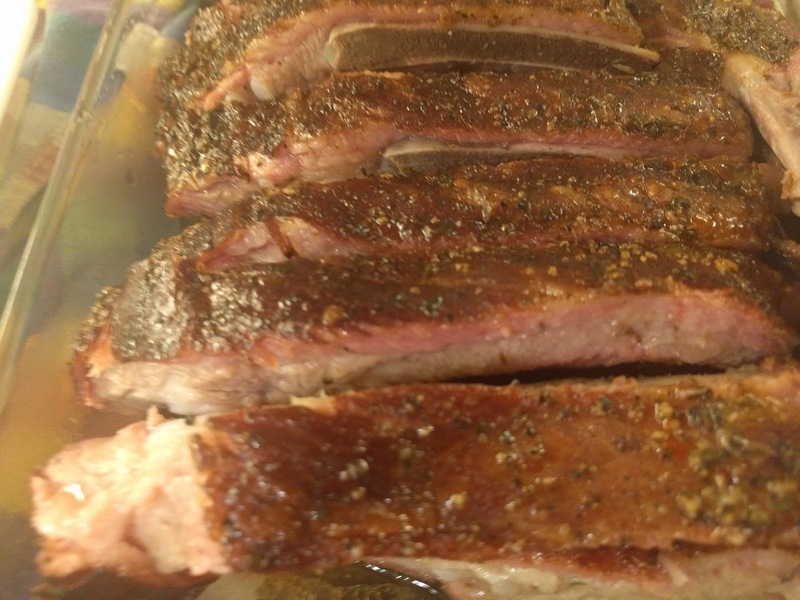 Pork ribs are the kind of thing that brings out opinions in everybody who makes them, and eats them--especially if they don't know anything about what went into them. Some people like them falling off the bone. Some like them to have a little tooth--the need to work for the meat a little more. Some pre boil or cook them in an oven, then finish them on a grill. Some go low and slow for a loooooong time. Some go for rubs, some brine, some marinate. Some spritz every hour with water or apple juice. Some want a vinegary finish. Some want a sauce glaze finish. Here's what I'm getting too--everybody brings their own expectations to the table when it comes to ribs, and in the end it mostly doesn't matter--ribs are not hard to cook, and not easy to mess up, but undercooked ribs are never pleasant in my book. I come from the school that puts a rub on the ribs a day in advance. 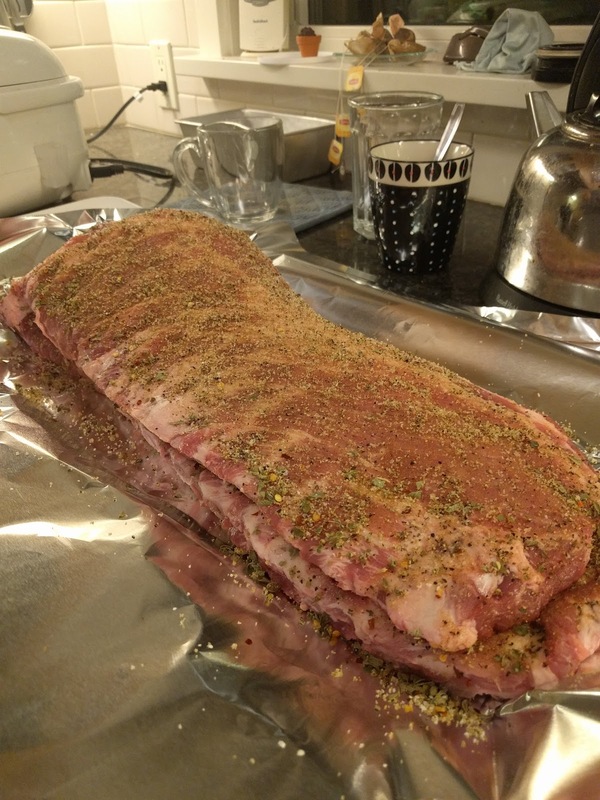 My rib rub usually has brown sugar, kosher salt, hot pepper flakes, cayenne, Old Bay, and oregano. I don't want to overwhelm the natural sweetness of the meat, so no garlic or onion in this one. Also, I'm not as fond of the vinegar heavy spritzes--just not to my taste. I start by drying my ribs and removing the silver skin from the back of the rack. Then I pour on a pile of rub and work it into the meat. Wrap the ribs tightly and put them back in the fridge for a day. 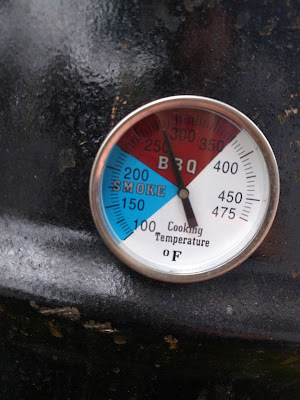 If I'm doing only one or two racks, I'll use a Weber kettle and cook the ribs indirectly. 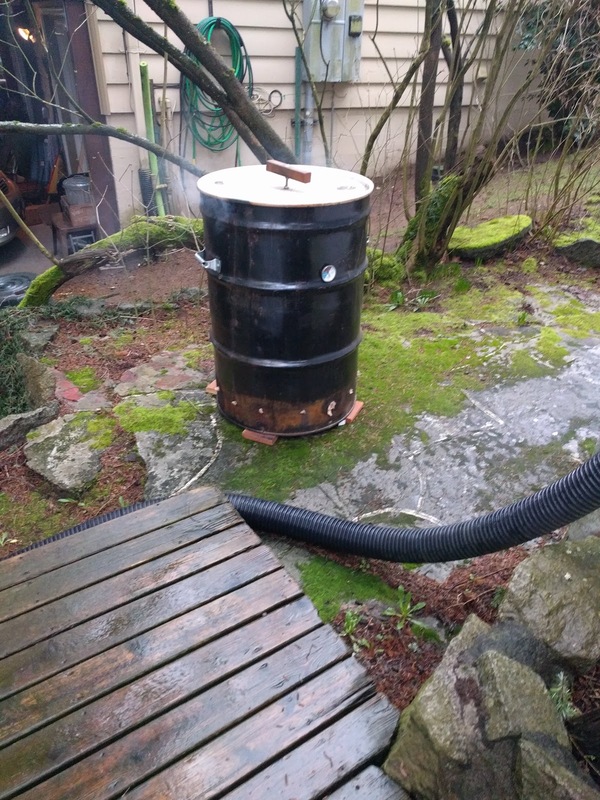 When I have 3 or more racks, I break out my UDS (Ugly Drum Smoker) made for me by a friend out of an old vegetable oil 55 gallon drum. In the bottom of the drum, I've piled a number of things to give the coal some space off the bottom of the barrel. 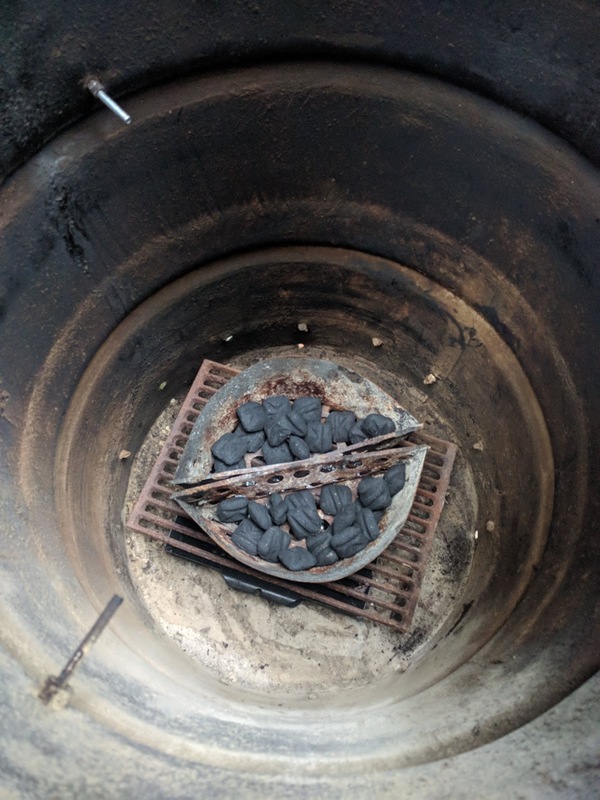 At the bottom, I have a square vented grill basket with about 1-1/2 inch sloped walls and foil in the bottom to catch the ash. On top of that is a cast iron grate, and the weber charcoal baskets are on top of that. When I first started using the barrel, I just poured charcoal onto the floor of the barrel, but I couldn't get good sustained even heat until I lifted the charcoal out of its ash. Pour a layer of unlit coal in the bottom of the charcoal baskets, then dump a canister of lit coal on top. 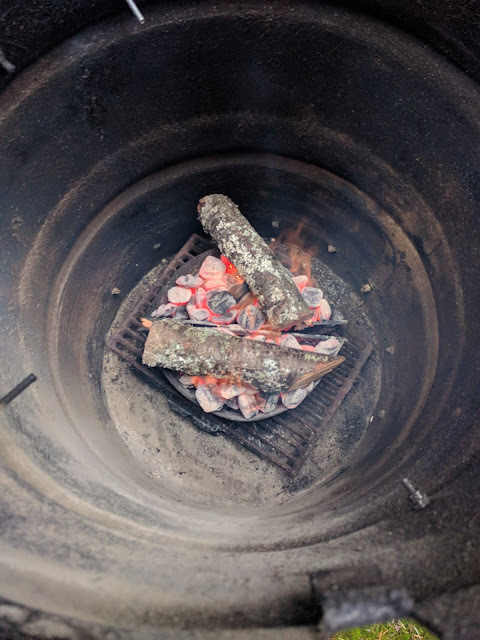 Place your smoking wood on top of the coal. 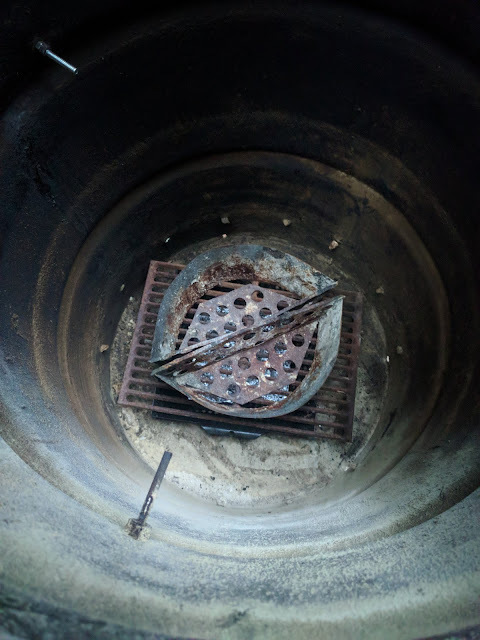 This barrel can accomodate hanging the meat or placing the meat on a grill suspended on two bolts and the BBQ thermometer protruding into the barrel. 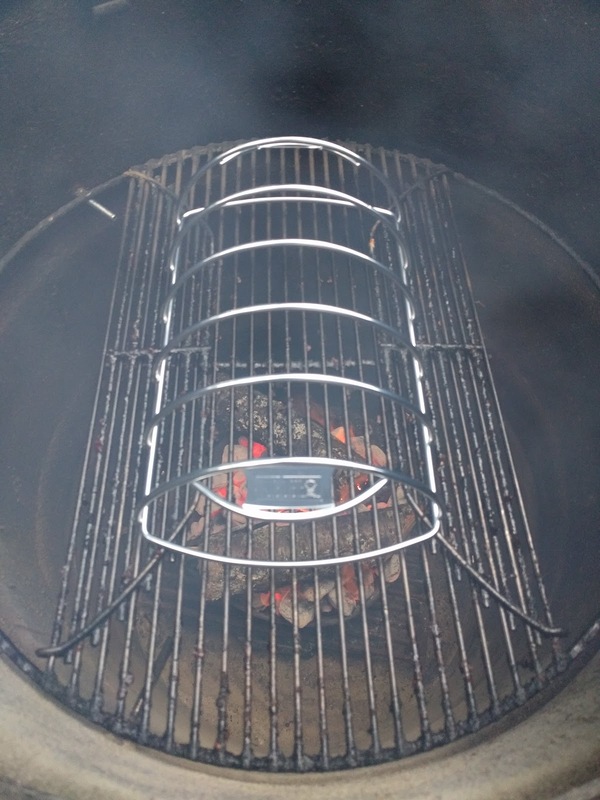 In this case, I'm using a grill and rib rack. This is 6 slabs of ribs--4 St. Louis cut and 2 full slabs. 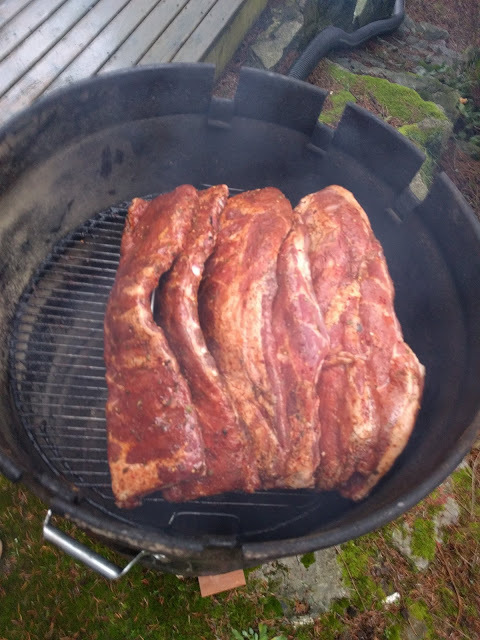 Every hour I come out and spritz the meat with water and move the ribs around so they cook evenly. This cook has the ribs on for about 4 hours at about 250-275 degrees. 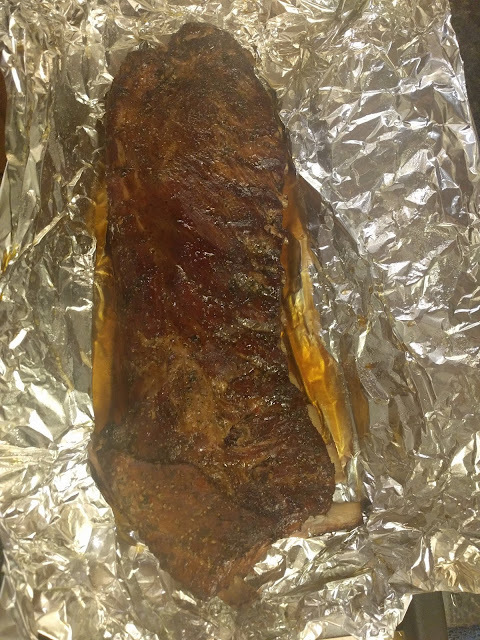 After 4 hours I wrap the ribs in foil and set them on grill (or oven) for another hours. I feel that an hour in foil finishes cooking the ribs to my desired tenderness--not completely falling off the bone, but not making me work for it either. It's a Goldilocks thing I guess. After unwrapping, the bones are protruding some, but not completely. Cut up the ribs and serve. I serve them with my sauce warmed on the side for those that like to dip, but they are just as good on their own.